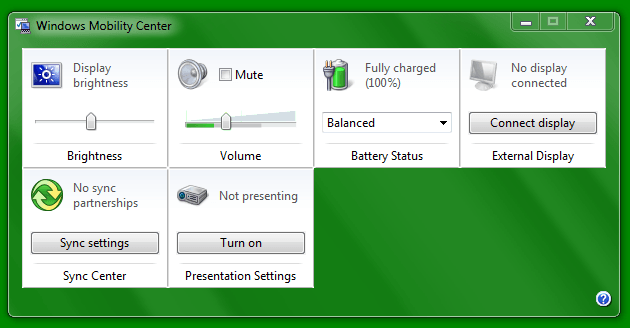 Turn ON or OFF presentation settings in windows 7 or windows 8, How to adjust presentation settings before giving a presentation. Windows Presentation Settings can play a vital role to make your presentation more impressive and exclusive if you have adjusted the settings correctly before giving a presentation. Basically, Presentation settings are the options on a laptop that can be beautifully used while giving a presentation. It will help you so much in case you’ve ever had your screen turn black during your presentation, then you’ll find useful the option allowing you to automatically turn OFF your screen saver each time when you give a presentation. You need to that when you turn on the presentation settings, your laptop stays awake but the system notifications are turned off completely. Even, you can also make some other nice changes according to your wish such as: turning off the screen saver, adjusting the volume of speaker, and changing desktop background image too. Step (1): Firstly, click on Start button and then make a click on Control Panel. Step (2): On the Control Panel page, click on Hardware and sound option then click on Windows Mobility Center. Step (3): Now on the Presentation Settings tile, click on the Turn On button. This will turn on the Presentation Settings. Step (4): In case you wish to off Presentation Settings, click on the Turn off button. This will turn off the Presentation Settings. Step (1): To customize the presentation settings, at first open the Windows Mobility Center as you saw in above steps. Step (2): On the Presentation Settings tile, make a click on Presentation Settings icon to open the presentation settings dialog box. Or you can open it directly just by typing presentationsettings.exe in Start Search and press Enter. Step (3): Now change the settings according to your wish and when you are done, click on OK button. I hope this article helped you. Feel free to inform us my sharing your valuable comment. We will really appreciate your effort. Stay connected with us to grab more helpful tutorials related to Windows 7 | Windows 8. I am not using windows 7 or windows 8, but this post might be useful for the users of windows 7 and 8. I can understand the point your are saying. Anyway thanks for share. Thank you so much for sharing your view with us and glad to know that you found this article useful for you. You always share interesting stuff, Amit. I use Windows 8 (even if I’ll change soon to an Apple Mac) and this article will come in handy.